All new kitchen just installed. BEDROOM ARRANGEMENTS: The master bedroom has a King bed and a full bathroom including walk in shower. The 2nd master bedroom has a Queen bed and its own full bathroom. There is a queen sleeper couch in the living room which can sleep children or young adults. Maximum of four adults and two children. Sheets and towels are provided in each bedroom and bathroom. Soaps and basic paper supplies are in the unit to get you started. 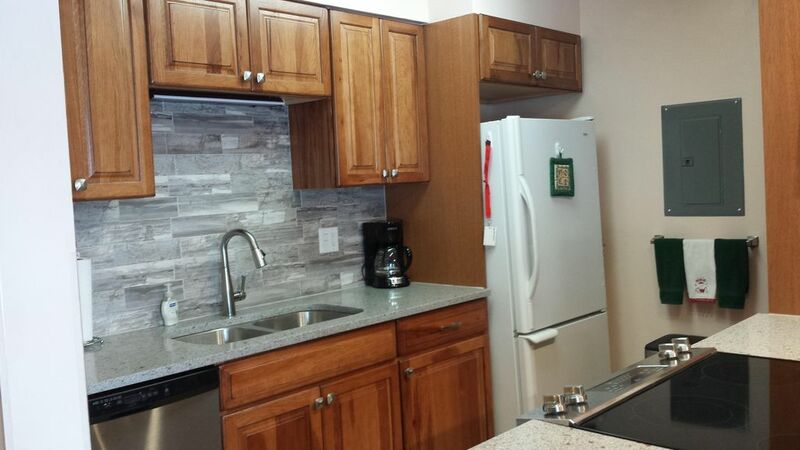 CONDOMINIUM AMENITIES: The kitchen is fully equipped with pots, pans, dishes, glasses, and silverware. Also, in the unit is a microwave, coffee maker, toaster, and crock pot. The living room has gas fireplace, HD flat screen cable TV with VCR, and stereo. On the back deck is a gas grill. High speed wifi internet connection in unit. LOCATION, LOCATION, LOCATION: This newly remodeled unit is located on the first floor which is great after a long day of skiing or hiking. The quaint Town of Dillon is a block away and hosts many restauraunts, movie theaters, live theatre, bowling alley, pool hall, shopping and night life. Lake Cliffe Condominiums is located half block from the ski area shuttle and just minutes drive time from the world class ski resorts of Keystone, Breckenridge, Copper Mountain, and Vail. EXTRAS: The beautiful views from the living room, dining room and deck of Lake Dillon are a beautiful year round. Just out the back door you have access to Lake Dillon for cross country skiing, snowshoeing, and sledding during the winter months. During the summer months, Lake Dillon has boating, fishing, 40 miles of bike paths, hiking, farmer's market, and concerts at the amphitheater. The condo was clean, spacious, and cozy. Owners communication before the trip was superb. Great overall experience, we could not have been happier with our stay. Had a great stay. Views were spectacular. Walking distance to restaurants, nightlife, and even grocery store. Condo was well stocked and had plenty of room. Minutes from Keystone, A-basin, Copper, and Breck. Would definitely come back. Summer activities look to be exciting and right out the door. Clean & Bright. Comfortable family-style condo. Lake Dillon, Keystone and Summit County resorts. Highly recommended. Clean and bright condo with comfortable beds and furnishings --- plenty of space for our family of three. Generous bath towels, updated bathrooms, plentiful kitchenware, cookware and large refrigerator were amenities that made our stay enjoyable. Quiet location, close to ski rental shops, grocery and restaurants. Easy to find. Easy check in. Owner ensured our visit was better than expected. We are eager to book our next visit. This place is great. My wife, and two kids had ample room. The kitchen is very well supplied. Location is great, minutes from Keystone, A-basin, and Silverthorne. Breckenridge is not far either. We will definitely come back. You can rent this for the same price as a 2 twin bed 1 bath hotel room, hmmm. No brainer.